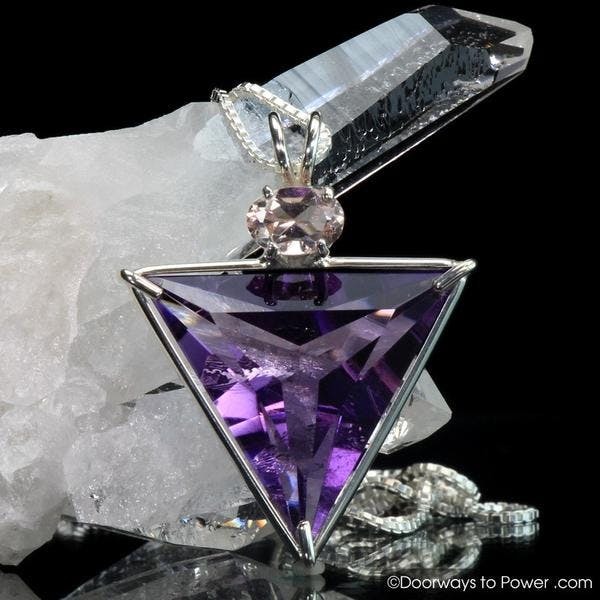 Dimensions 1" x 1" x 0.35"
Amethyst embodies the Violet Flame, using its healing power on all levels. Highly useful in meditation and one of the most effective as it calms emotions. More than most Quartz Crystals, it quiets the mind allowing connection to spirit. It opens & clears the third eye and crown Chakras, which accelerates the development of intuitive and psychic abilities. Morganite (known as PINK emerald) is rare and beautiful, heart energy that effortlessly cleanses and activates your heart, bringing love into our life. It opens the flow of loving thoughts that lead to action and reverence for all of life. Helping us to act from love, so we can speak from the heart. Morganite is known both as an angel stone and a heart stone. It can bring love to one's live or rekindle old love. It helps with communicating with angels. Morganite also brings compassion, empathy, self-control, and patience. It can also balance emotions and ease the pain of separation. It has been said to be one of the highest frequency stones available. Gorgeous piece. It feels very powerful to wear. I got chills when I first put it on. I am satisfied with my pendant, stones are very beautiful, the shipment was fast and very secure; thank you for the bracelet hematite, it is very beautiful.